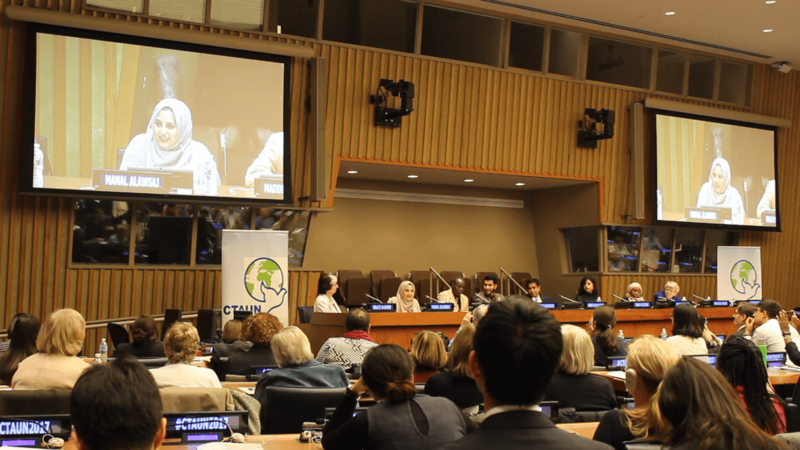 CTAUN’s timely conference on refugees urges educators and individuals to be advocates for truth. On International Holocaust Remembrance Day, in a room packed with more than 700 teachers, students, advocates, and refugees, ready to engage with each other on the issues facing the refugee crisis, the US President was mere hours from signing a grave executive order. What has unfolded in the past 48 hours has been a dizzying assault on America’s values: the suspension of the US refugee program for 120 days, the barring of nationals from seven predominately Muslim nations, and the refusal of entry, and subsequent sending back, of people arriving to the US legally, who were fleeing war and persecution. On Friday, January 27, I attended CTAUN’s 18th annual conference, this year titled: “Refugees: the 21st Century Challenge.” Weeks or months earlier, when we registered for this conference, we did not know the context in which we would be meeting on this day. Despite the looming executive order, we carried on, and I want to highlight the concrete and inspiring ways we can help, as highlighted by many of the speakers. There are many misconceptions and fears about refugees. Please read and share, “Seven Common Myths About Refugee Resettlement in the United States” which dispels many common assumptions. It is vitally important to address these harmful myths within our communities, schools, and close circles. Bill Frelick, director of Refugee Programs at Human Rights Watch, was vocal in denouncing the rhetoric from the current administration. Frelick also highlighted that while responsibility and action needs to come from the UN and governments, it is crucial that we as individuals, through our interactions with others, fight against xenophobia and discrimination in our classrooms, homes, and communities. Many organizations rely heavily on volunteer and pro-bono service to operate and serve the community. One of the speakers, Isabel Saavedra, a formely undocumented immigrant who is now an attorney for Catholic Legal Immigration Network (CLINIC), spoke about the vast human rights abuses she has witnessed in US family detention centers. She highlighted the CaraProBono project, which seeks volunteers in its mission of ending incarceration and inhumane treatment of undocumented people. If you are not in a position to donate to an organization, please consider giving your time and skills to support a refugee or immigrant-serving organization in your community. Food, safety, and shelter are indeed important for refugees. However, education and language hold the keys to progress, security, and advancement. Universities should consider expanding scholarship opportunities specifically for refugees, or join the IIE Syria Consortium for Higher Education in Crisis. For students in the refugee camps, a solid and stable education is scarce. “They need help from the outside, ” said Mark Harris, President Emeritus of ELS Educational Services and Berlitz. “They need volunteers, they need NGOs, they need people to get in there and teach language.” Without language proficiency, refugees have significant troubles accessing the new country’s education system, if they are resettled. To help, higher education professionals and non-profits should mobilize to help provide quality language training for the youth waiting for resettlement in these camps, a place where their education has been interrupted. At the end of the day, no matter your political views, religion, or beliefs, it’s important to have empathy and support for our fellow humans. I believe that one of the goals of teaching is not just to pass information. It is inspire or motivate students to become invested in local and global issues. The classroom can be a catalyst for organizing for positive change. I will always remember the day that my high school French teacher introduced our class to a man who had survived the Rwandan genocide. For over an hour, he talked to our class about his story. A story of loss and escape. It was a day that impacted me profoundly. It infused a sense of empathy in me that I, and my classmates, may not have gained had we encountered the topic of the Rwandan genocide through a textbook or article later in life. While this empathy is important, I realize it is not enough. While the refugee crisis and the individual stories of these millions of people are nuanced, with polarizing political responses and complicated solutions, educators can still play a role at a grassroots level. While it may be impossible to stop the cause of the crisis, we can help educate our community, try to increase inclusiveness within our classrooms, and work harder to understand the issues facing refugee students in the U.S. We can start with inspiring action within our students, which I believe is absolutely necessary as this next U.S. Presidential administration takes power. I look forward to attending CTAUN’s 18th annual conference, “Refugees: the 21st Century Challenge”, at the UN Headquarters on January 27th, which will provide a comprehensive overview of the issues and initiatives facing this crisis. Below is the day’s schedule for the event. You can RSVP here and follow CTAUN on Facebook here. Opening Session – 10-11 a.m. Morning Panel — The Issues – 11-11:45 a.m. Awards – Excellence in Education and Poster Awards – 12-12:20 p.m. Lunch & InfoFair – 12:20-2 p.m.
Student Refugee Group – 2-2:30 p.m. Afternoon Panel – Assistance & Solutions — 2:45-3:30 p.m. Closing – CTAUN Global Citizenship Award – Fernando Reimers, Harvard 3:30-4 p.m.
As we enter 2017, the world faces a myriad of pressing issues: protecting the environment, expanding and guarding women’s rights, and promoting global peace and security. On January 27th, 2017, CTAUN’s 18th annual conference, “Refugees: The 21st Century Challenge”, at the UN Headquarters will give us a chance to hear from refugees and learn how we can become involved to help find solutions. When I reflect on the importance of this conference and the fact that “refugees” was chosen as this year’s focus, I see an important chance to deepen our understanding of the issue, and hopefully, prompt us to work harder for local solutions. 1.) Gain a better understanding of refugee students’ challenges and experiences within our local communities. Racism, discrimination, or stigma due to refugees’ religious or cultural differences is reported in numerous studies of refugee educational experiences in the U.S., such as in Haffejee’s 2015 study of African refugee youth experiences in U.S. public schools. “What are the cross-cultural issues involved in assimilation, and the challenges to host nations?” will be one of the questions discussed at this year’s conference. By understanding and discussing these challenges, we can work to create more inclusive classrooms and local communities. 2.) Learn how we can help the refugee education crisis at a grassroots level. The refugee crisis is an unprecedented modern crisis. Not only is it the largest forced displacement of humanity since the UN’s founding, we currently have an entire generation of youth deprived of their education. While it might seem daunting to approach solutions at an individual level, it is not impossible. Learning what initiatives are working and which are not can give us new insight and ideas for future collaborations and initiatives within our local communities. This year’s conference will discuss some of the current initiatives, with speakers from UNHCR and refugee-focused non-profits. 3.) Promote global awareness within our classrooms and communities. Why is it important for people to be engaged with issues that are perhaps beyond their immediate community? Increased cross-cultural understanding and improved global relations are a few reasons. Educators can help students develop “…a global civic identity and understand how their decisions have an impact ranging well beyond their immediate vicinity,” according to former UN Secretary General, Ban Ki Moon. Bringing the topic of the refugees into the classroom is one way to begin this global engagement and understanding amongst students. I am continually inspired by the efforts of CTAUN and similar organizations to support teachers in developing their students’ engagement with world issues. Let’s utilize these resources and support networks, and take action to help support refugees within our local communities. I look forward to joining you at the conference on January 27th! You can RSVP here. We are living in a world that has the most globally displaced people since Word War II. (UNHCR, 2015). While governments and policymakers grapple with the refugee crisis, educators and refugees’ receiving communities also play a role in shaping their future. With a generation of refugees deprived of their education, how can educators and individuals help alleviate this crisis? This will be one of the many questions explored at the Committee on Teaching About the United Nations (CTAUN)’s 18th annual conference, “Refugees: The 21st Century Challenge“, at the UN headquarters on January 27, 2017. Educators and community members interested in deepening their understanding of the refugee crisis, from current initiatives to hearing from refugees themselves, are encouraged to attend. You can RSVP here. CTAUN, a non-profit whose mission is to increase students’ engagement with the global community by providing educators with resources to teach about UN-initiatives and activities, believes that education is a powerful tool for change.